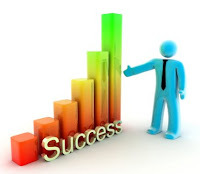 Prosperous Entrepreneur- Marketing and Success for Advisors: Goals are Dreams With Deadlines! I am so grateful that I am blessed with the ability to live a purpose-driven life. I know what I want and I know the kind of life I want to lead. I'm still on the journey but I'm getting really close. I think the reason I have been able to create so much financial success in my life is because I have goals. I don't let my day run me over, I plan my day every day. My big secret is: I have business goals that guide me. I have shorter term goals I call my Success Book. I continually write down my shorter term goals day after day in a book I call my Success Book (simply a three ring notebook). These are the actions that drive my business such as monthly revenue, number of new clients, number of referrals, and unique website visitors. I have long term goals I call Big Picture goals. This includes things like the sample mini business plans I will be writing in the next six months. I sell a system for creating a mini business plan and I plan to provide additional sample business plans for a CPA, Dentist, Realtor, Wine Bar, and Attorney. We are more than halfway through the year. Are you still working on your goals? Or have you slacked off a bit in favor of warmer weather? Please don't lose your focus – keep moving forward working on your goals. After all, goals are dreams with deadlines! !